My wedding is at an estate. The ceremony is outside in the gazebo around 630 at night. The cocktail hour will be in the outdoor pavilion and the reception is going to be inside the estate house. It is a very beautiful location but I have no idea what color flowers I want to do. I am running very short on time (wedding is next month :/) I am looking for a romantic theme something like mid summer nights dream. For centerpieces I was thinking of submerging orchids with a floating candle. I also need to incorporate peacock feathers, my fiance believes them to be good luck. So I need something that will match those. Any ideas? 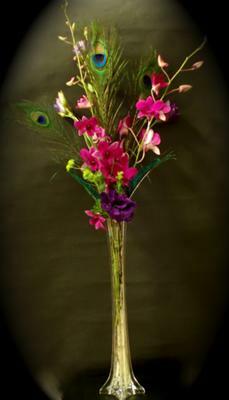 You can create great centerpieces with orchids and peacock feathers. Most that I have seen are tall using the height of the peacock feathers and then a stem of orchids. Green and purple orchids best match the peacock feathers colors and then it looks as if they are meant to be together. To keep the costs down you may want to look at using Eiffel vases which although are tall they are narrow and then you don't need as many to create a great display. If you want to submerge the orchids then maybe look at using a cylinder vase with one floating candle at the top and the feathers to the sides of the vase. I just worry that the feathers may catch alight. Feathers don't submerge well! You can still add candlelight by having glass votives dotted around the vase or you can buy LEDs that go in the vase which would then light up the whole centerpiece. If your fiance loves peacock feathers you could also incorporate them into a Boutonniere. Peacock feathers always bring the best look in any decoration. They just got the unique styling and you have blended it with a combination of orchids which was amazing. I just loved this center piece. I am very happy to read this post regarding the two different centerpieces. I think both of them are very much attractive. So it is much better to use these centerpieces. Thank you very much. Keep updating!